Metal shingles are a popular roofing choice due to their longevity and low maintenance requirements. Available in a wide variety of shapes, colors, sizes, and finishes, you'll find shingles available to complement any architectural style. However, many homeowners delay to install metal roofing because of the expense and expertise required. Metal shingles mimic almost any existing shingle type. They are also available in colors and styles unique to the material. Due to the wide variety of metallic shingles available, be sure to look at several manufacturers' offerings before making a decision. In general metal shingles fall into one of the following categories. 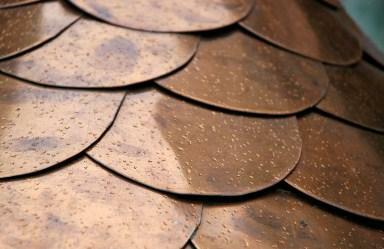 Copper Shingles: Copper shingles can either be solid copper, or copper bonded to an asphalt shingle. The copper bonded shingles allow a homeowner to have the appearance of a solid copper roof at a fraction of the cost. Slate Shingles: These shingles are painted and molded to appear to be slate. While past models may not have been convincing, contemporary metal slate shingles are indistinguishable from authentic stone. They are also far lighter than stone, making a slate roof a possibility for more homes. Wood Shingles: For homeowners that seek a more rustic appearance, there are metal shingles that look like aged wood shingles. Tile Shingles: Metal shingles can also be made to look like authentic clay tiles. Asphalt Shingles: For traditionalists, these shingles appear to be plain asphalt shingles. Metal Shingles: These shingles make no attempt to hide their material. Instead, they often take advantage of their ability to be brightly colored and molded into interesting shapes. Installing metallic shingles, unlike installing asphalt shingles is beyond the scope of a do it yourself project. Not only are the techniques required to install metal roofing difficult to master, but the high material costs makes even small mistakes cost prohibitive. However, the lifespan of a metal roof makes it a cost effective option even when installation costs are considered. In order to get the most value out of your budget, be sure to interview and get quotes from several experienced contractors and compare them to an online roof estimator that considers your area of the country.